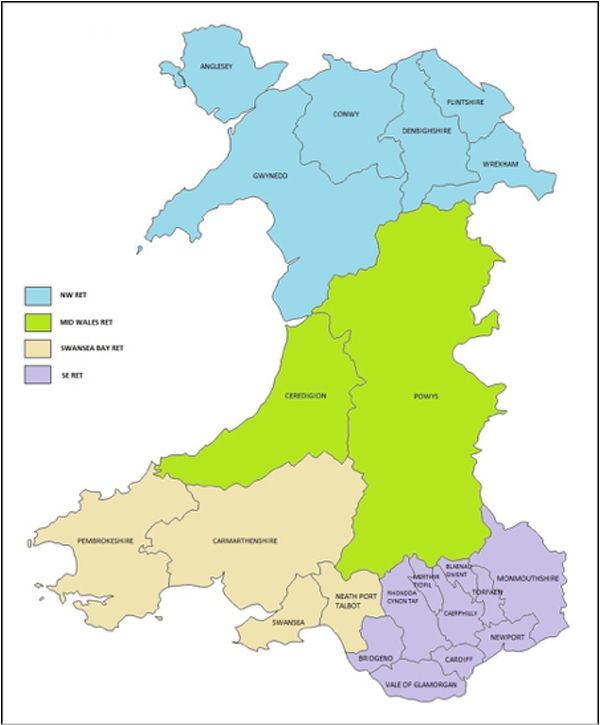 Four Regional Engagement Teams (RET) have been set up across Wales to help ensure EU funding proposals meet existing and future opportunities and investments at regional levels – North Wales, Mid Wales, South West Wales and South East Wales. Acquire intelligence on regional priorities/discussions from regional working groups. Ensure regional consideration and participation within national strategic projects (additionality of activity, impact on skills demand/supply, ensuring cross-sector engagement, alignment with strategic ambitions, ensuring integration and no duplication). Supporting regional aspects of Monitoring and Evaluation and Cross-Cutting Themes. Monitor and assess the impact and scope of European funded activity in the region through regular contact with WEFO and other funders and with Lead Beneficiaries to accurately gather information to inform regular reporting. RET teams supporting/integrated across City Region Boards (Swansea Bay & Cardiff City Region), North Wales Economic Ambition Board, Growing Mid Wales Partnership and Regional Skills Partnerships.